Cinch leads Corazon and Twister along a bench east of the county road in Spring Creek Basin on Oct. 20, 2007. TJ Holmes has been visiting the Spring Creek Basin Mustangs since 2002. 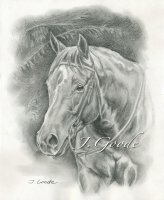 In 2007, she began documenting the herd. She is essentially the herd’s historian. She keeps track of births, deaths, band structure and so much more. 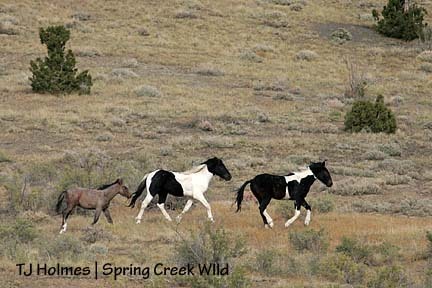 If something happens in the Spring Creek Basin Mustang herd, TJ Holmes has probably documented it. Working as a volunteer for the BLM, TJ Holmes acts as an advocate for the Spring Creek Basin Mustangs. Because she knows the horses so well and on an individual basis, she is an integral part of the herd management. TJ implements the herd’s PZP program on the Spring Creek Basin Mustangs. PZP is a birth control protocol that has kept the Mustang levels at a manageable level. 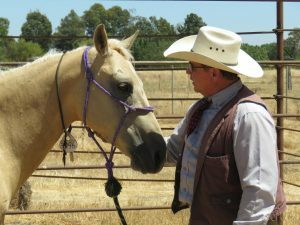 Much of the PZP methods used on Mustangs was taught to TJ by her mentor, Jay Kirkpatrick of the Science and Conservation Center. As an accomplished photographer, TJ chronicles the progress of the Spring Creek Basin mustangs on her blog, SpringCreekBasinMustangs. We talk to Dr. John Tolley of Bakersfield Veterinary Hospital – Large Animal Division. Dr. Tolley covers the basic veterinary needs of your horse. As a horse owner, you know horses can be expensive. If you know what to expect, you may be able to prevent unnecessary costs. In this episode, Dr. Tolley covers vaccination protocols, worming protocols, feed and nutrition and a whole host of topics about horse-keeping. If you own a horse you will want to listen to this episode. We get down to brass tacks in some areas talking about prices for pre-purchase exams and lab tests. 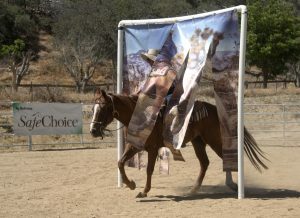 If you are thinking about getting a horse, learning about basic veterinary needs of your horse will eliminate surprises. 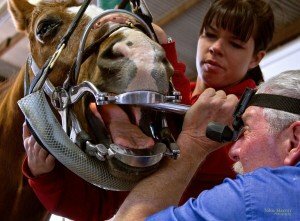 Learning your options about feed, worming and dental programs can ensure you enjoy your horse for a long time. We also recap our experience we chronicled in a previous podcast about Extreme Cowboy Racing. For being our first year competing, we made an improvement over the course of the season, we had a lot of fun competing, and we met a lot of great people. Ranae finish 2nd in the State Final competition with Dusty. She learned a lot about her horse and how to negotiate the various obstacles. Scratch and I had a unique final experience that I talk about in the show. Scratch ended up 2nd in the State standings. Do you know what your horse’s normal temperature is supposed to be? How about his heart rate or respiration? Do you know how to take your horse’s pulse? In an emergency, this information can help your vet assess the situation much more quickly and save valuable time in getting your horse treatment. 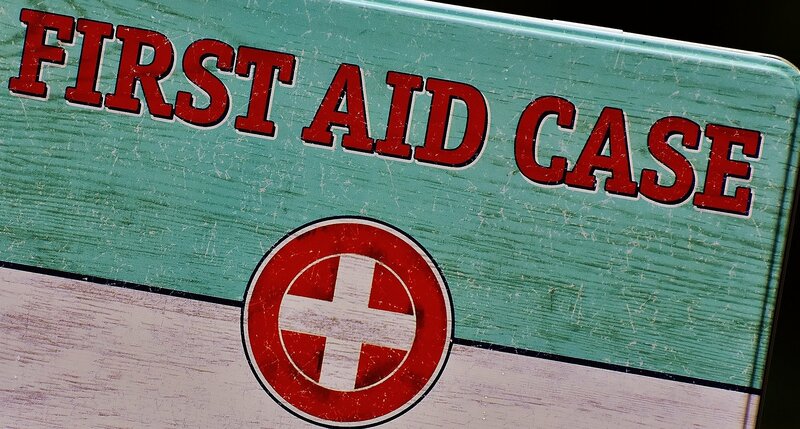 This week we present a rebroadcast of a 2015 seminar we attended about emergency treatment. 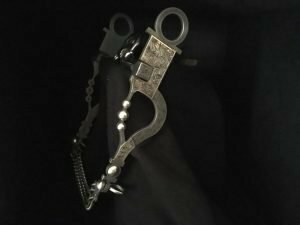 We discovered there are many wives tales out there about how to dress a wound, what to do when you suspect colic or founder. 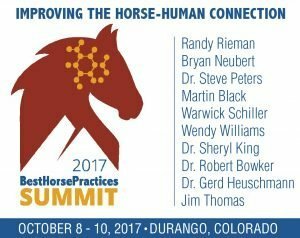 Dr. Jeff Hall of the Zoetis Corporation presents a comprehensive overview of how to handle many situations. The seminar, sponsored by Bakersfield Large Animal Veterinary Hospital, was recorded in a banquet room – sorry for the background noise – but we think the information is important enough to warrant airing this show.